Electric-scooter sharing is the newest app-based transportation option to pop up in American cities. They’re not coming to Seattle just yet. The city wants to figure out a permanent plan for stationless bike shares before it tackles scooters. The shareable electric scooters that have popped up in cities across the country, causing both elation and consternation, aren’t coming to Seattle streets. At least not yet. The city has informed all companies operating scooter shares in the U.S. that they can’t launch on Seattle streets until the city gets a permit program in place, said Karen Westing, a spokeswoman for the Seattle Department of Transportation. And a scooter-share program won’t be ready until the city firms up a permanent program for the stationless bike-share companies that have been operating in Seattle for nearly a year, Westing said. Two of those bike-share companies, LimeBike and Spin, recently launched stationless electric scooters in San Francisco. They work much the same as bike shares do in Seattle: Find a scooter or bike, unlock it with a smartphone app, ride it where you want to go and leave it in an appropriate spot. Similar scooters — like a razor scooter with a small electric motor — began popping up in Washington, D.C.’ Austin, Texas; Los Angeles and Miami, among other cities. The Washington Post posited that they “might revolutionize urban transport” — if only people and companies used and deployed them properly. 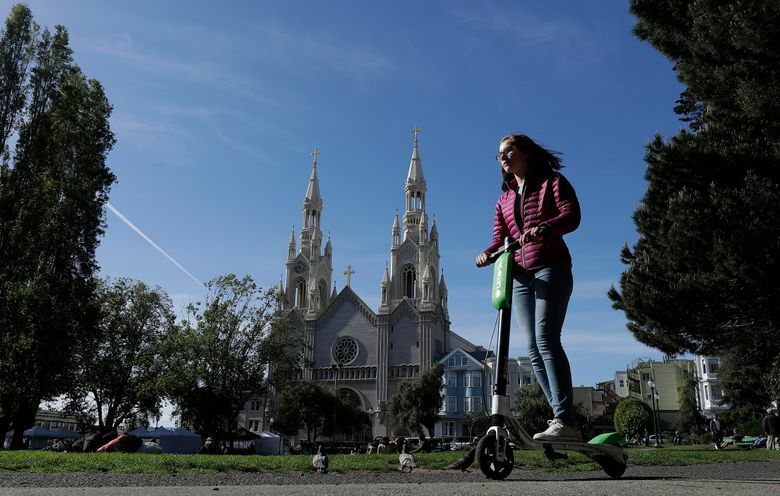 LimeBike and Spin, as well as Bird, a third electric-scooter company, began operating in San Francisco before the city finished setting up a permit program, raising the ire of regulators. On Monday, the San Francisco city attorney sent the companies cease-and-desist letters, not ordering them to stop operations, but ordering them to stop operating illegally. City Attorney Dennis Herrera said that his office had received a rash of complaints about the scooters. Those complaints were similar to the most frequent complaints about Seattle’s bike shares: riding on sidewalks, riding without helmets and scooters blocking sidewalks. Herrera stressed that he didn’t want to shut the companies down but they must operate within the law. The San Francisco Department of Public Works has seized more than 120 illegally parked scooters from city sidewalks. In Seattle, city law bans motorized scooters from operating on sidewalks, bike paths or bike lanes. Seattle allows bikes on sidewalks, and a recently passed state law allows most electric bikes on sidewalks and bike lanes. LimeBike included electric-assisted bikes in its Seattle fleet earlier this year. The stationless bike shares in Seattle launched last year, initially on a six-month pilot program that was to expire at the end of 2017. The pilot morphed into a yearlong program that will run through July, while SDOT analyzes data on the bike shares and works on permanent regulations. SDOT is likely to present its findings to the City Council next month, Westing said, and the City Council will then decide on a permanent program.